The historical and cultural context of fame in the twenty-first century Today, celebrity culture is an inescapable part of our media landscape and our everyday lives. This was not always the case. Over the past century, media technologies have increasingly expanded the production and proliferation of fame. Celebrity explores this revolution and its often under-estimated impact on American culture. 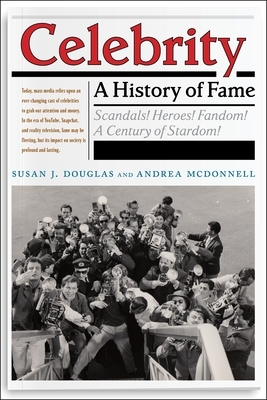 Using numerous precedent-setting examples spanning more than one hundred years of media history, Douglas and McDonnell trace the dynamic relationship between celebrity and the technologies of mass communication that have shaped the nature of fame in the United States. Revealing how televised music fanned a worldwide phenomenon called "Beatlemania" and how Kim Kardashian broke the internet, Douglas and McDonnell also show how the media has shaped both the lives of the famous and the nature of the spotlight itself. Celebrity examines the production, circulation, and effects of celebrity culture to consider the impact of stars from Shirley Temple to Muhammad Ali to the homegrown star made possible by your Instagram feed. It maps ever-evolving media technologies as they adeptly interweave the lives of the rich and famous into ours: from newspapers and photography in the nineteenth century, to the twentieth century's radio, cinema, and television, up to the revolutionary impact of the internet and social media. Today, mass media relies upon an ever-changing cast of celebrities to grab our attention and money, and new stars are conquering new platforms to build their adoring audiences and enhance their images. In the era of YouTube, Snapchat, and reality television, fame may be fleeting, but its impact on society is profound and lasting.